As far as movie comedy went, the 1980s were pretty male-centric. Chevy Chase, Steve Martin, Bill Murray, Eddie Murphy – they were among the top stars of the day. There were plenty of funny women in that decade, but they generally got shoved into supporting roles or were second bananas to the guys. One exception was Whoopi Goldberg, who headlined a string of comedies in the mid- to late-'80s and into the '90s. In 1987, she got what was supposed to be her Beverly Hills Cop, an action comedy called Fatal Beauty. It was a flop, pulling in just $12 million at the box office. Still, it's interesting as a rare showcase of female comedic talent from that era. The movie is now on Blu-ray from Olive Films. Goldberg plays Rita Rizzoli (a role originally written for Cher), a narcotics officer with a rebellious attitude toward her superior officers, plus a closet full of costumes she uses to go undercover. She stumbles onto a major case after discovering that a bad batch of cocaine has hit the streets under the name of “Fatal Beauty.” The substance was improperly cut, making it deadly to anyone who takes it. Rizzoli believes that the man behind all the drug dealing is local businessman Conrad Kroll (Harris Yulin). Once she starts investigating him, Kroll assigns his security chief, Mike Marshak (Sam Elliott), to keep an eye on her. Eventually, Rizzoli convinces Marshak that his boss is dirty, and together they set out to get Fatal Beauty off the streets for good. Fatal Beauty owes a lot to Beverly Hills Cop, and Fletch, and Running Scared, and 48 HRS. It definitely tries to fit into the same category as those pictures. (Like Fletch and Beverly Hills Cop, it even has a Harold Faltermeyer score.) The success rate is much lower, though. Director Tom Holland – working from a screenplay by Hilary Henkin and Dean Riesner – never quite hits the sweet spot in balancing action and humor. The film clunkily moves back and forth between them, rather than getting them to work in unison, as those other pictures did. That said, Fatal Beauty has its share of compelling qualities, chief among them being the chance to see Whoopi Goldberg at the relative dawn of her screen career. Today she's more known for co-hosting The View and occasionally saying controversial things in that capacity. It's easy to forget how inventively funny she once was as an actress. Rizzoli's costumes allow her the chance to develop humorous alternate personas (a la Fletch). Goldberg also earns some laughs with her expertly delivered wisecracks, and she shares a surprisingly charming chemistry with the always-dependable Sam Elliott. In this regard, the movie represents a fun look back at a comic performer with a unique voice. As was par for the course back in the day, the movie has a decent soundtrack full of pop songs by then-popular artists like The System, Shannon, Levert, and Debbie Gibson. 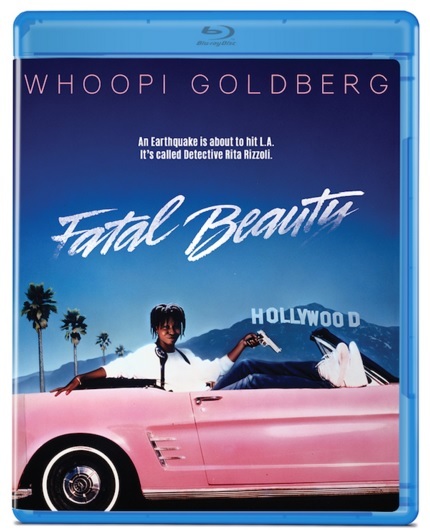 Olive Films has also helped Fatal Beauty to look and sound good on their new Blu-ray release, which additionally includes the original theatrical trailer. This is by no means a great movie, but there are some pleasures to be found in it. And it's definitely cool to revisit Whoopi Goldberg when she was on the verge of major stardom. For more information on this title and others in their collection, please visit the Olive Films website. Fatal Beauty is rated R for sequences of violence, drug content, and strong language. The running time is 1 hour and 44 minutes.